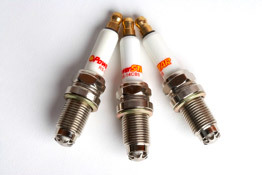 Q: Why do PowerSTAR spark plugs look different and what does the “STAR” do. A: The PowerSTAR spark plugs look like your ordinary spark plug except for the tip. The STAR shape creates multiple point gaps that allow for faster starts and less fouling. Multiple point gaps allows the spark plug to ignite on more then one point gap and create the heat necessary to ignite the air fuel mixture. Unlike conventional spark plugs the PowerSTAR plug doesn’t fire from a concentrated point tip it is spread out in a large 360-degree dispersion area. Q: What is indexing and why do you need it? A: Indexing refers to the orientation of the “J” or “L” shape ground electrodes in the combustion chamber. When the spark fires in a conventional plug the expansion of the flame kernel is blocked by the "J" ground strap. This slows the expansion of the flame kernel, slows the progress of the burn and doesn’t allow the most horsepower and torque from one spark. Racers place washer stacks to change the orientation of the ground to optimize the burn. PowerSTAR spark plugs generate a flame front from all points of the star over a much larger surface area. This generates a larger faster flame kernel from all sides. This is what helps to give your engine more power. Q: What is throttle response? A: When you step on the accelerator pedal or twist the throttle on a motorcycle you can instantly feel the engine come alive with more power. This is what we mean by better throttle response. Q: The PowerSTAR changes the sound from my motorcycle, why? A: The sound that you hear is a deeper sound cause by the simultaneous ignition of the multiple points. The explosion in the combustion chamber is bigger using more pressure. For fuel injected Harley-Davidson motorcycles you get a deeper throaty sound closer to the sound you got from your old carburetor. Q: Will the installation of a PowerSTAR spark plug affect my warranty on my vehicle? A: NO. In 1975 the Magnuson Moss Act was passed and it prevents a manufacturer from voiding a warranty based on a customer's selection of parts that the dealer or manufacturer does not offer. As long as you follow our installation instructions and those of the engine manufacturer the use of our product won’t void your vehicle warranty. Q: What modifications do I need to make to my engine to use a PowerSTAR spark plug? A: No modifications need to be made as long as you have electronic fuel injection in your vehicle. Since most of today’s car and motorcycles have fuel injection the only thing you have to do is make sure that you reset the engine control management system or ECM. This is easy to do just by disconnecting the positive battery terminal connection prior to starting up the engine after replacement. Please consult our insulation instructions. To get more performance out of your PowerSTAR spark plugs or if you have a carbureted engine please read our installation guide. Q: What is the “Green Effect”? A: The Green Effect is helping the environment by curbing emissions that contribute to global warming and smog. Every engine today has oxygen sensors that help the ECM fine turn the engine. The Oxygen sensors monitor the amount of oxygen in the exhaust both before and after the catalytic converter. A more complete burn of the air/fuel mixture reduces the amount of unburned Hydrocarbons, Carbon Monoxide, and Oxides of Nitrogen (NOx). PowerSTAR spark plugs burn more of the fuel that would be sent out the exhaust pipe that contributes to smog. The PowerSTAR spark plugs help you get better fuel economy, which means less fuel is burned. Also your catalytic converter doesn’t have to work as hard. Q: What is smog, and how do PowerSTAR spark plugs help reduce it? A: Motor vehicles generate three major pollutants, nitrogen oxides, hydrocarbons, and carbon monoxide. Hydrocarbons react with nitrogen oxides in the presence of sunlight and elevated temperatures to form ground level ozone. This is called smog. It can cause eye irritation, coughing, wheezing, and shortness of breath. This can lead to permanent lung damage. Nitrogen oxides contribute to acid rain, and to water quality problems. Carbon monoxide is a colorless, odorless, deadly gas. It reduces the flow of oxygen to the bloodstream, and can impair mental functions and visual perception. In urban areas emissions from vehicles are responsible for more than 90 percent of carbon monoxide in the air. Motor vehicles also emit large amounts of carbon dioxide, which has potential to trap the Earth’s heat and cause global warming. 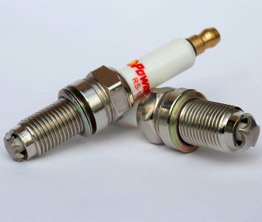 By using PowerSTAR spark plugs you cut the amount of fuel burned from getting form point A to point B. This helps to reduce the amount of carbon dioxide you vehicle emits and minimizes global warming. Q: How does the PowerSTAR spark plug work? A: This is what is happening inside your combustion chamber. Due to the high intensity of the electric field created by the ignition coil we have strong lines of flux coming off the tip and curving around the cap toward the STAR points. This also creates a corona effect which, can ionize the oxygen between the gaps. This creates hot spots at the tips. Hot spots in a combustion chamber are good if they are controllable. As the tips heat up electrons will be emitted where the field strength is the greatest. The amount of heat that is created at the tips is enough to cause a combustion event at the same time that the spark jumps the gap with the highest energy level and smallest path to ground. Our plugs are designed with tight tolerances between the gaps. The difference between the gaps will actually even out as the spark plug is “broken in” . Q: How long do the PowerSTAR Spark Plugs last? A: While we have multiple simultaneous ignition events, we only have one spark jumping the gap and eroding the metal. Our STAR is made with a high strength Nickel-Cobalt alloy. The alloy is stronger than the typical Nickel used in center electrodes. Our spark plugs will last 5 to 8 times as long (depending on the number of tips) as a conventional Ni center electrode. For the standard Nickel tip spark plugs the average replacement interval is about 30,000-45,000 miles. You were pushing it if you put 30,000 miles on set. Your car would still work but your performance will be degraded, and if it was wintertime you most likely had problems starting your engine. The Platinum and Iridium plugs claim 80,000 – 100,000 miles. The wear curve is much longer. You actually could have a poor performance lasting much longer and not notice the degradation due to the longer period of time. You know the feeling you get when you feel that your car isn’t working like it did yesterday? We offer our guarantee with our spark plugs. For Automobiles we offer a 3-year/ 50,000 miles (2 year/ 20,000 for motorcycles) guarantee with free replacement. We also offer a 30-day satisfaction guarantee. Q: PowerSTAR Spark Plugs look longer than my OEM spark plug, is this okay? A: In most stock cases this is okay. Some aftermarket big bore kits use domed pistons or in a stroker motor there might be some contact with the piston. If you have one of these kits you should measure the distance from the spark plug seat and piston at the height of it's stroke @ TDC. If there is a chance of contact you should use an indexing washer to lower the height of the spark plug protect the piston.